We’ve been renovating our farmhouse kitchen this past month. Bad timing to say the least, but we’ve been hanging in there and it’s almost finished! I’m excited to get cooking with this week’s share…. Green Beans – The little farmer (who is now 5 1/2 and who has requested that I drop the “little” part) has been talking about the green bean harvest non-stop. In fact, the countdown has been on since last Tuesday, so we’ve been listening to him carry on about the mechanics of the harvester and the vibrating sorter for a week! As you can imagine, we were all relieved when the big day came yesterday and he was able to live the dream riding on the back of the harvester and working the mechanical sorter for hours on end. 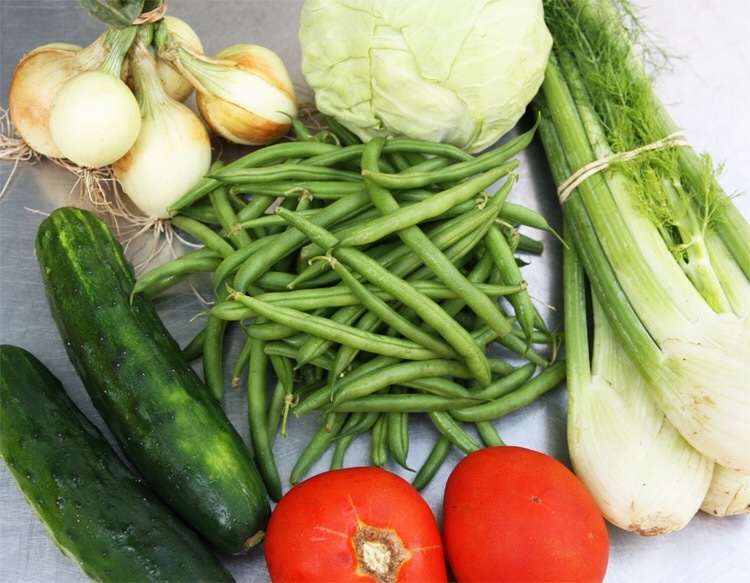 The delicious string beans in your shares this week are fruits of his (and many others) labor. These really are a treat, as you rarely find them available in stores, especially not organic ones! Please note that they are washed and bagged, but anywhere the bean may have been slightly bruised, there may be a little rotten spot. They must be stored in the fridge, and I would poke a few holes in their bag for ventilation. Eat them tonight! Steam gently until they turn a bright green – maybe 3-5 minutes. I like them with a little crunch, but taste them and see what you prefer. Serve these first ones with a touch of butter (or olive oil) and some salt. That’s all they need! So sweet, so delicious, such a beautiful summer treat. Tomatoes – The harvest is just starting up. These are a wonderful beefsteak variety with a lot of flavor. Don’t overthink it with these – just slice and serve drizzled with a good olive oil and salt & pepper. Caprese salad with sliced fresh mozzarella and basil is lovely too. Cucumbers & Onions – These are meant for each other in a quick salad. You could even add the tomatoes! Dress with olive oil, red wine vinegar and salt & pepper to taste. I crush some garlic in there too. Cabbage – This hot week calls for a slaw. Try one of the recipes I’ve compiled this week. Fennel – It’s a love it or hate it veg, but I guarantee you’ll love it one way or another. If you like the “licorice” flavor, then you’re better off eating it raw. Try this week’s salad recipe. If you’re really not a fan of the flavor, then cook it! It looses that strong flavor and the texture when cooked is divine. In the fridge… Poke a few small holes in the Green Beans bag for ventilation and store in the fridge. On the counter… Tomatoes – eat right away when fully red and ripe!